Good ideas for starting or improving your garden — even if you don't have a lot of space. Also, finally something to do with your empty jars, milk jugs, and other things destined for the trash. Finally something to do with your empty milk jugs and two-liter bottles. Learn how to make them here. 2. Start seedlings in a citrus peel. Use any type of citrus peel: grapefruit, oranges, pomelos, or lemons. Poke a hole in the bottom and then add seeds, soil and water. Once the seeds have taken off, transplant the whole thing in the ground and the peel will take care of itself! 3. 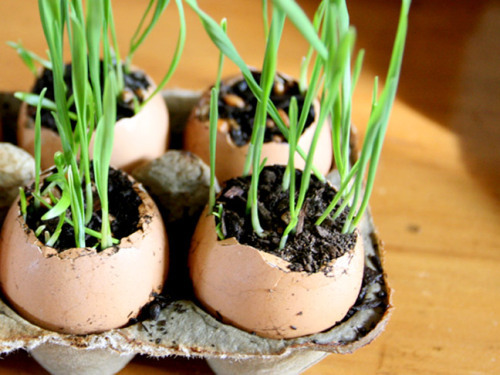 Start seedlings in an egg carton. Pretty much the same as the citrus peels. If you don't want to clean out the eggs, seeds can be placed directly in the egg carton. 4. Create self-watering seed starters. 5. Fashion a watering can out of a recycled detergent bottle. 6. Make a herb garden with jars. Learn how to make the jars' drainage system here. 7. Make a planter for your jar garden. 8. Create magnetic wall terrariums. With magnetic backs, these terrariums can be placed on any metal surface. Directions here. Learn how to make these beauties here. 10. 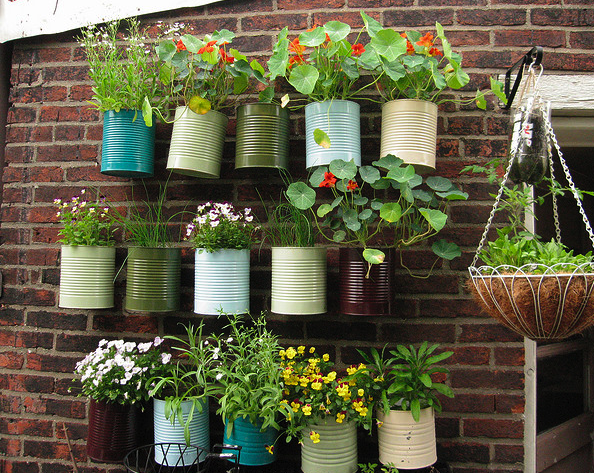 Turn old cans into planters. Use either old coffee cans or paint cans. Poke holes in the bottom for drainage and then paint the cans. For more details go here. Mount your new can planters. Not enough space for all your can planters? Learn how to mount them here. 11. Make a tapestry out of a mirror frame. Find out how to create this vertical succulent garden here. 12. Construct hanging terrariums out of bait bags. Get the full instructions for these beautiful hanging pots here. 13. Assemble a plant stand. Dust off the step ladder in the closet and lay wooden planks or baking sheets across the steps to make a plant stand. 14. Make a super mini-garden in a teacup. Put succulents in a teacup. 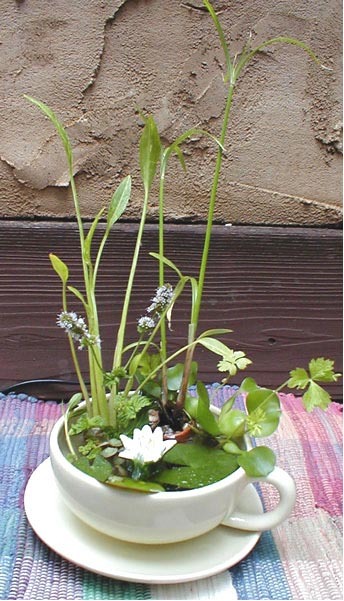 You can also grow a mini-pond in a teacup. 15. Put together a crate garden. This idea is great for people who don't have a lot of outdoor space to start a garden. Get the details on how to make a wine box garden here or a crate garden here. 16. Make a magnetic garden organizer. This will help you from always forgetting where you put your gloves. For instructions go here. 17. Fashion a hanging garden. All you need is three baskets, rope, soil, seeds, and two screws. Directions here. 18. Make garden markers out of kaput spoons. Now you can do something with those spoons half-eaten by the garbage disposal. Instructions here. For ideas on how to make garden markers out of soda cans or pottery shards go here or to make them out of clay go here. 19. Make a vertical garden out of a shoe caddy. 20. Prepare a water garden. Use pea gravel instead of dirt, so the water will not muddy. Warning: Keep this project away from mosquitos! 21. Create a string garden. The "Kokedama" is a Japanese form of gardening that is basically a bonsai grown in ball form, covered in moss and living outside of a pot. This is perfect for people who have too many mosquitos. Directions here.